Welcome to our new blog and our new website! We are utterly DELIGHTED to have finally got with the 21st century and gone online – it has taken a while as we have usually been too busy designing and making new gardens to concentrate on web design and all its joys. Thanks to the efforts of our talented team – Pascale our gorgeous photographer who generously crawled out of bed to photograph gardens as the sun came up, Emma who so beautifully designed the site and Christoph the brilliant web developer who has put it all together, we are there! We hope you enjoy perusing it. Also, spring has arrived – the wintery bare branches and brown earth of early March seem a distant memory – all is lush and green – and somewhat soggy at the moment as we are having lots and lots of lovely rain – just what the gardens needed. It’s a magical time in the garden, with the trilling of the birds, the unfurling of foliage and flowers, and the promise of peonies, roses and sun-drenched lawns to follow. Oh no - there’s a duck! We planted up the Victorian stone urns around the hotel at Cowley Manor - hundreds and hundreds of plants in bold colours - orange, lime and purple - they will look amazing when they all come into flower. Wedding season is soon upon Cowley - just hope the weather improves. We had to leave one urn for planting later as a wild duck was nesting in it. She was remarkably brave and sat tight while we pottered about around her! The perfect weather for getting jobs done outside. I have been planting seeds in my own cutting garden. Last year, larkspur was wonderful so that has gone in again along with love-in-a-mist and Orlaya grandiflora for a start. All really easy. Last week we visited the Canal House Hotel in Amsterdam where the tulips were in full bloom and looking fabulous in shades of cream, purple and bright pink. It was so exciting to see our garden coming to life, it’s always a treat to visit gardens after they have been created. Fat buds of alliums and growing spires of foxtail lilies were also racing skywards, giving a hint of what is to follow. We planned the garden for a succession of flowers in creams, mauves and sultry purples enlivened by lime flowers and foliage. Later alchemilla, roses, clematis, wisteria and irises will proivide the summer palette. These will be followed by monkshood and bugbane (Actaea simplex ‘Brunette’) in autumn. Whilst in Holland, we went to visit a huge display garden of tulips, narcissi and other spring bulbs – fantastic for assessing the best varieties. You might think that garden designers spend most of their time actually in gardens, which often turns out not to be the case. Every day in a garden yes, but a good deal of time is spent in our offices. My only lasting New Year resolution (!) was to have flowers on my desk every day of the year. I’m talking real flowers fresh from my garden (or Rose’s!) – not 24-7 heated and illuminated, sprayed and fertilised, jet lag weary, air-con frazzled frights that are ubiquitously offered. I’m looking now at today’s merry medley posie that my daughter helped me find – Vinca major, Geranium phaeum ‘Album’, cowslip, aquilegia, leaves of Alchemilla mollis and a pigeon feather. Gorgeous. Some of our collection have already gone – lilac, Meconopsis cambrica and pear leaves (that are such a breathtaking green) didn’t stand even a few hours in a vase. It’s not been hard to find beautiful flowers and leaves every day since January 1 and I’m carefully noting those that hold their heads high for several days. It has also been wonderful to ‘get out there’ and watch the glorious spring unfurl. 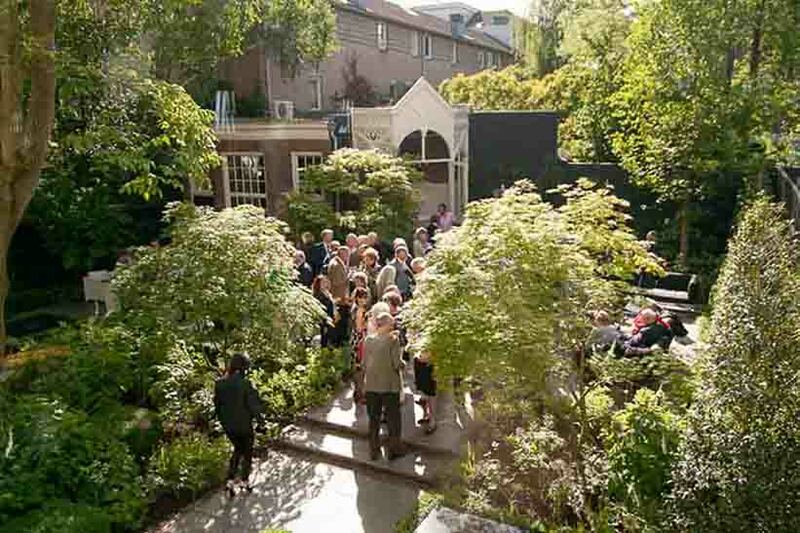 Next week a fabulous Dutch contingent arrive – we’re off to SW3 and also some of our other favourite gardens. Better get back to plant ordering! “Look Mum, this is for you…” Poring over paint charts deciding colours to use for one clients obelisks, planters, porchway and rose arches, I looked up to see my rosy-cheeked three year old offering me a daisy… In fact, the most beautiful daisy I have ever seen. That was the trigger. Off we went, looking for more daisies. 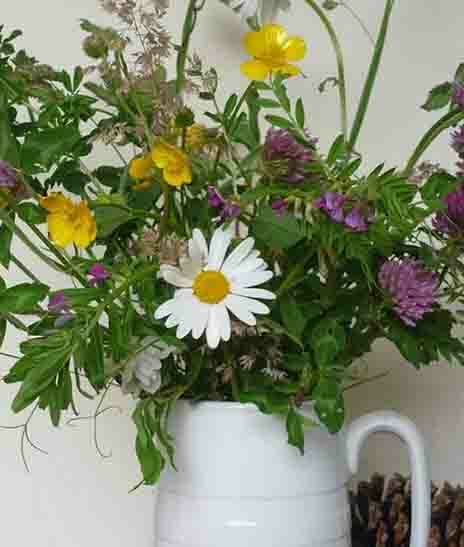 There are so many beautiful ‘wild’ flowers in our country, that can often be dismissed too easily. As garden designers, we feel blessed if we are able to use them. Certainly Digitalis purpurea, Primula vulgaris and Viola odorata appear regularly on our plant lists. If we are really lucky, we can add Red campion, Meadow buttercup, Lady’s Smock, Ragged robin and Green winged orchids to our list too. 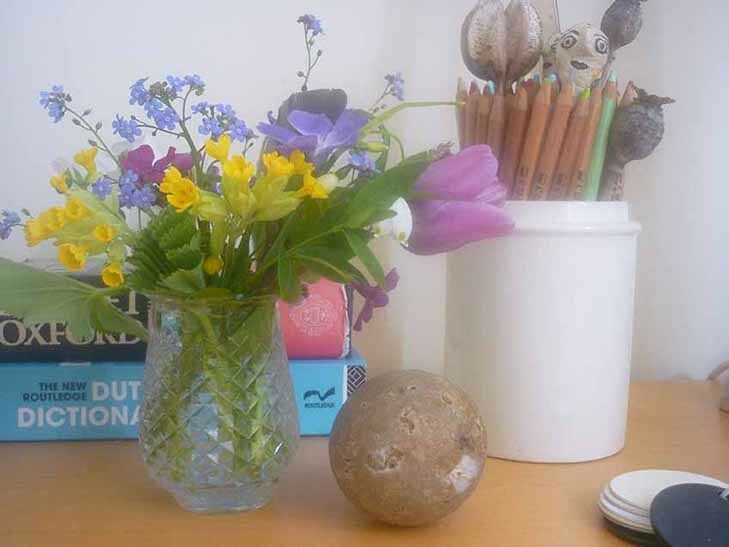 We had a lovely ramble – I felt energized and Freddie exhausted as we came home with a partly ethereal bunch of wild grasses and flowers from my parents wild flower meadow. Not all carefully picked but still brilliantly beautiful in a brilliantly understated, in fact rather un-wild way. A far cry from Chelsea Flower show last week, but equally fun. It’s always a treat when clients tell us how pleased they are with our designs, but perhaps even greater compliments are those we don’t actually hear. As it happens, recommendations provide us with almost all of our work – we are blessed to have such lovely clients! A similar feeling of satisfaction was felt when I overheard a conversation between two Dutch ladies as they entered the garden at Canal House. “Heel Mooi” it began… They had got up early and were the first (of 4,000+) visitors looking at the garden as part of Open Tuinen Dagen Amsterdam 2012. I’d recommend this three-day event where 28, mostly privately owned, gardens behind 16th and 17th century canal houses are opened. Rose and I hired bicycles and raced along the different grachts, visiting them all and meeting many of their owners. One of my favourites, by designer Michael van Gessel, at Keizersgracht 173 takes on new dimensions when viewed from the higher storeys. We also loved the enormous Buxus planting that disguised the level change at Kerkstraat 67. I could go on and on…. the sun shone all weekend, apart from one mighty downpour when, bedraggled and peckish, we stopped off at a dear cousins new home on the Singel… and looked at their garden too!! Although we are regularly at our house near Southwold, we don’t want to have to wield secateurs and spades the moment we arrive. Plastic plants aren’t an option so, over the years, I have been trialling various plants that I love (specifically that remind me of holidays) and that don’t mind a bit of neglect. In fact, more than not minding, they must actually thrive on neglect! I’m gradually whittling the list down – ruthlessly taking things out that don’t make the grade and trying out others. Our clients also benefit from this exciting exercise. Equally important, planting combinations have become simpler – with large bolder clumps working effectively. 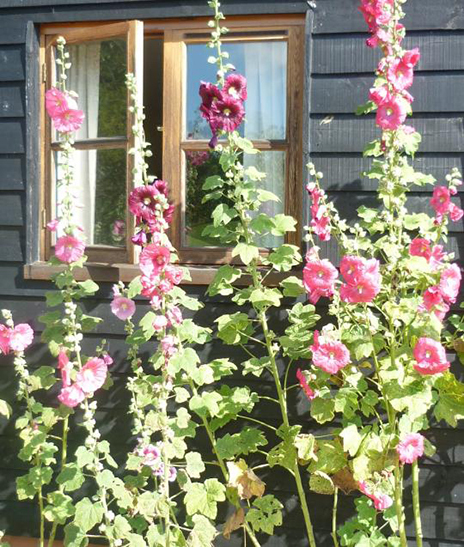 These hollyhocks outside a bathroom window have passed the test – months of flowers, insects and interest. Since this photo, I’ve selected and kept the plants and colours I most like, as well as adding selected seeds of other interesting colours. Out! with the fleshy pinks and wishy-washy yellows – in! with the clear, intense, almost iridescent showstoppers. Double flowers are also definitely off the guest list. One day, I’ll set to with my finalised list… and hope that the new garden furniture will get more use than the spade! The first frost always galvanises me to plant spring-flowering bulbs in pots or the ground - their beautiful, organic shapes are nature’s equivalent of slow-motion fireworks. It is a party in the spring to look forward to! This year I’m trialling single, late-flowering tulips and I’ve selected those I hope will be elegant, long stemmed and in radiant colours. They’d better be good – my all time favourite tulip family – the Lily’s – have been left off the invitation list. 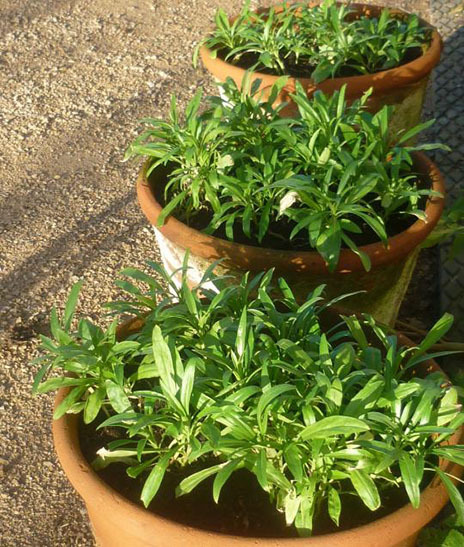 I’d planned to plant various, repeating combinations, including Tulipa ‘Caravelle’ (deep beetroot) with T. ‘Palestrina’ and T. ‘Perestroyka’ and tall orange wallflowers; and Tulipa ‘Greuze’ with T. ‘Esther’ and T. ‘Paul Scherer’ with tall pink wallflowers. On a bright morning, all was progressing well until two of my ultimate treasures offered their help. In fact, insisted. Every bribe and lure was ignored, so my well constructed seating plans of bulb combinations looks set to be….. SPECTACULAR! Do come and see the results in May. Note – we supply beautiful, bespoke mixes of spring and autumn flowering bulbs, that add a vital layer to planting schemes. We carefully take notes (before our hands turn blue), then dash back into the warmth and optimistically wait for the conditions to be right to make the necessary tweaks. Can you see the ha-ha we installed? We hope not! At Dale & Heybrook Landscape Design, we design and maintain timeless and beautiful landscapes and gardens to enjoy every day of the year.